So, I've been part of this group for quite a few years now and have moved through many phases of my spiritual journey along the way. While in Korea during the years 2009-2011 I spent a great deal of time exploring the theology and spirituality of the Eastern Orthodox church. During this time my thoughts and beliefs became aligned with many aspects of their theology. Many of these aspects Catholicism holds in common with Orthodoxy. Having received many of these truths from Orthodoxy, I also sided with them regarding certain historical and theological emphases that the Orthodox hold against Catholicism. But earlier in the year when Phil challenged me to reconsider my "Eastern Orthodox bias" I decided to re-look at the issues. Long story short, I've been swallowing great volumes of Catholic history and theology and am enjoying the process immensely. So much so that a couple of weeks ago I attended my first mass - and had a wonderful experience. I do of course still have some questions, which I am discussing with a Catholic acquaintance here in South Africa. But I'd also like to open up the discussion here with my online community with whom I've walked a lot longer than most other Christians in my life. At the moment my questions lie in the area of conversion, regeneration and baptism in the Holy Spirit. How do Catholics understand regeneration and reception/baptism of the Holy in Non-Catholic Christians. Because while I am not a Catholic I believe I have been regenerated and have received the baptism in the Holy Spirit. I was baptized in the Dutch Reformed Church as an infant, but left the church as a teenager. I had a major conversion experience as a young adult (which I've discussed at Shalomplace over the years) and received Christ as my Lord and Savior. I desired to be Baptized since my family had lost touch with their Christianity, and to be quite honest I didn't even know I had been baptized as an infant. A few weeks before being re-baptized a missionary, from a Pentecostal background, prayed for me to be baptized in the Holy Spirit. During his prayer for me I felt filled by the Holy Spirit and began to speak in tongues. I'm wondering how all this might be understood in terms of a Catholic theology of baptism, regeneration and chrismation/baptism in the Holy Spirit, especially given that these are seen as sacraments in the Catholic Church and therefore tied, at least in part, to the sacramental priesthood. I have other questions but will wait to see if anybody has any thoughts on the above. Jacques, glad to hear that our discussions here have had such a positive influence in your life. Footnote 7 refers to Titus 3:5 and Jn 3:5. What is called the "baptism of the Spirit" seems to be more a deeper surrender to the Spirit than a being gifted by the Spirit. Again, it's obvious that this goes on all throughout Christianity. WOW, you attended Mass? That's interesting news! I think there's a Charismatic parish down there, isn't there? You might really enjoy that kind of spirituality since you have prayed in tongues before. I see you have a Christ the King Church too. Keep us posted. Thanks for your reply Phil and Shasha. Will have to still check out the parish landscape as I continue to walk this path Shasha . Phil, I suppose my questions regarding baptism in the Holy Spirit relate more directly to the Catholic sacrament of Confirmation/Chrismation (in the Eastern rite). I was listening to a talk from the Institute of Catholic Culture in which the speaker was addressing the fact that the eastern rite confirm even infants directly after baptism and that this was the true practice of the early church. This wikipedia article says the same thing. It was explained that confirmation/chrismation are the equivalent of the biblical baptism in the Holy Spirit. But if it is a sacrament of the Catholic Church then how can it be explained that this reality is being experienced outside of the sacramental priesthood. What does the Catholic church teach regarding the experience of sacraments outside of the Church (Catholic)? Since baptism in the Holy Spirit is such a fundamental teaching in most charismatic and pentecostal churches, how does the Catholic church understand the working of the sacrament outside of the sacramental priesthood? Another question I have is how baptism and confirmation relate to free will and our right to desire or reject relationship with God. If infants are baptized then their free will is not considered an important issue in their introduction to God. If they are then confirmed or chrismated immediately, as in the Eastern rite, then even the baptism in the Spirit is given without consent of the will. I just wonder how the Catholic Church understands our freedom to choose/reject God? You'll understand that I'm coming from a Protestant background that lays heavy emphasis on personal choice in accepting Christ as savior and personal desire to receive the baptism in the Holy Spirit. Jacques, we've been doing some soul-searching in Catholicism (at least in the U.S.) for some time now concerning the meaning of Confirmation. Please do check out the Catechism for some straightforward teaching on this matter, as I think it will answer some of your questions, especially concerning the distinctions between Confirmation and Holy Orders. On the one hand, we DO receive the Holy Spirit with Baptism, but because we baptize infants (as well as older folk, of course), their life in the Spirit is constrained by developmental limitations. For decades, Confirmation was used as something of a rite of passage to "confirm" young people in their faith and pray for the full release of the Spirit as they move into adulthood. The rite of passage approach is currently on the outs, at least theologically. Some dioceses baptize teens, others younger; converts receive Baptism and Confirmation together. None of this has any relevance to Holy Orders, however, except that you need to have been baptized and confirmed to receive Orders. Infants are claimed by their families for Christ and his Church before they know what they're doing, that's true. They are also taught a language they didn't choose to learn, and were born into a culture and a family they didn't choose. The hope regarding Baptism is that its graces influence their growth unto being the kind of person God made them to be. So instilling a bias within a soul for good is not a violation of a child's free will, but a gift given them by their parents. There's enough bias going in the other direction, for sure. But, later, they will have to choose to go along with what they were given and taught, and often they don't, usually through neglect. Phil, you say that the "rite of passage" approach is currently on the outs. What is the current focus then? How is it being rethought? I wasn't so much wondering how confirmation relates to Holy Order. But rather how denominations and church traditions (like Pentecostals) who have no Holy Orders are still able to receive the sacrament in some sense. I mean, maybe I am way off here, but doesn't the Catholic church teach that only the ordained priesthood can confer the sacraments of the church, at least most of them (I know marriage and baptism are exceptions - is Chrismation/confirmation also an exception?) If Pentecostals are receiving baptism in the Holy Spirit, does the Catholic church recognize this as equivalent to the sacrament of confirmation? Hope I'm being more clear - and thanks for taking the time to interact with me. I will check out the catechism as well. Jacques, see http://catholicism.about.com/o...s/p/Confirmation.htm for a good discussion on Confirmation. Some dioceses still do use it as something of a rite of passage and initiation to spiritual adulthood. If one is a child and a convert, however, most dioceses will administer both Baptism and Confirmation together before first Eucharist. It's kind of all over the place. Confirmation and the pentecostal baptism of the spirit aren't the same thing, however, at least not the way Confirmation is ministered these days. Maybe it was a kind of "second baptism" in the early Church (it actually came first on one occasion in Acts), but that's not the case today. Most Catholics who are confirmed do experience charismatic gifts, but probably not tongues, prophecy, healing, miracles -- the kind of charisms evidenced in pentecostal/charismatic circles. Interestingly, this is often where kundalini phenomena is also observed. Many Protestant traditions do not recognize Confirmation as a Sacrament. The Catholic Church would indeed recognize the Baptism of most Pentecostals to be valid but would not consider their baptism in the Spirit to be an equivalent of Confirmation. A convert from such a tradition (e.g., Assembly of God) would be invited to receive the Sacrament of Confirmation at some point on their journey. I'm not sure if this should be posted elsewhere. But I thought I'd put it here since Jacques was reading some of Taylor's works in connection with wanting to learn more about Catholicism. This is an interview with Taylor Marshall on the "Journey Home," actually his second one. It's a five-year follow-up since his first appearance on this show. Taylor is so delightfully honest and humble about his conversion and being a "baby Catholic." He says it's been the hardest thing he's ever done, but also it's the best thing he's ever done. Taylor was an Anglican priest, and it was painful for him to take off his collar. I find it interesting that he identified a lack of authority to be a serious pitfall in his former Anglican Church, and a primary reason he split. Quite a reversal from many disgruntled Catholics who gripe about the Magisterium. He shares beautifully about how he came to give up the idea of being a priest and mentions the on-going grace of the Sacrament of Matrimony. I learned from this interview about a common misgiving that Protestants have about the Church, what he calls the "zero sum" game. I realized that I used to think like that too when I was a Protestant, but I didn't see that I held such an implicit assumption. You'll really enjoy this interview. Finished watching, it was great, thanks for the link. He touched on something I'm finding both a challenge and a joy in my walk towards Catholicism...the rosary. In RCIA we received instruction on how to pray the Rosary (Oh yes, my wife and I have joined the RCIA class at our local parish - if all goes well we'll be received into the Church next Easter - YAY!!). It has been both challenging and encouraging and also sometimes just plain strange. I'm not used to praying to anybody but God (Father, Son and Holy Spirit) and here I'm spouting off Hail Mary after Hail Mary. The funny thing is that it has been a generally good experience. I'm interested in whether those of you who post here pray the Rosary and what Marian devotion is like in your spiritual lives? How does it interact with your devotion for the Trinity? That's great news, Jacques. I hope the RCIA process goes well for you and your wife. The Rosary: I was "force-fed" this so much when I was in grade school that I haven't prayed it much since then. I do pray the Magnificat daily in the Liturgy of the Hours, and believe what the Church teaches about Mary and her role in salvation history. I pray for her intercession a times, and feel that she has a motherly concern for me and all people. Fr. Basil Pennington wrote a good book on the rosary, Praying By Hand: the Rosary As a Way of Prayer. He was a leading teacher on Centering Prayer and found the rosary to be a helpful way to shut down the noisy mind and direct one's spirit toward God. I can understand not wanting to do something that is forced on you, especially if it didn't seem helpful at the time. My biggest concern is that the large number of Hail Marys said in such a repetitive manner may lend itself to 'thoughtless prayer'. I like to mean what I say and say what I mean and I don't really like the idea of meaninglessly repeating something so that it drifts into the background while I concentrate on achieving some other purpose, even if it is a greater purpose. If Hail Marys simply keep my mind busy so that my Spirit can connect with God, it seems a bit like an abuse of our Holy Mother? And yet besides all of these questions/concerns the experience of praying the Rosary has still been a positive one. I need to look into the Liturgy of the Hours. Are the two (Hours and Rosary) given equal importance in Catholic Prayer practice, what is 'normal' in Catholic devotional practice? I totally agree with you on this, Jacques! I have those same feelings. I really don't like the fast pace that most people do the Hail Mary also. I'm almost panting for breath to keep up with others and find it distracting to be worried about keeping up at the expense of meaning what I say. Slower, intentional praying is more my thing when I pray Hail Mary or Our Father, etc. Like Phil, I also pray the Magnificat during evening prayer as part of the Liturgy of the Hours. Fortunately, I was not force-fed anything Catholic, per se, so that doesn't trouble me. In fact, I wish I had heard some good people pray Hail Mary with tenderness in my childhood. I never heard it at all. I often pray this at bedtime with my sons. Long ago, I felt drawn to the simplicity and surrender and humility of Mary, a 14 year old girl (roughly) who responded with "Be it done unto me according to Thy Word." My appreciation of her shot up when I read a book about her appearances in history. When you read of Holy Mary's appearances all over the world to simple, poor people (often children), at different points in history, that will really change you. She has a special role in salvation history. I mean, what other Saint in Heaven behaves like this? Also, I am drawn to her because she is Our Lady of Mt. Carmel, and I am in formation studies in a community of Secular Discalced Carmelites. So, she is all around me, so to speak. I don't feel that all new (or old) Catholics need to speedily adopt an instant Marion devotion. I know you're not saying that, Jacques. These various 'Catholic things' come to grow on you, if they were meant to enrich your life. The Lord will show you the right rhythm and forms of how best to know, worship, and love Him and the Church. Jacques.. there is nothing better than ' thoughtless prayer' ) .. but i agree with you with, the whirl wind ' rosary's do not make a lot of sense for me either. I have been praying the rosary for years and over time, grace has changed the landscape of praying the rosary significantly. for many years i focused on the mysteries... today i do not so much anymore.. but looking back, i see it as a needed step in deeper union with God..
today i do not use imagination as much as placing myself ( centering) standing before God with full concentration on the words, taking each word , each phrase and placing it within my heart.....sincerely and utterly addressing the Blessed Mother and Jesus through these words.. making the words my own. i say the words and the intent slowly as if they were in the room .. which they are. Thru the prayer i began to see and know that the mind that tried praying and was so distracted, is not me... that there is something deeper to us and if we persevere , and trust Jesus and the Blessed Mother , through the most Holy Rosary and other church prayers we are drawn to them in ways we ourselves cannot do.. that the rosary and all other prayers are a vehicle to Them... and we are lifted out of mental prayer that uses words and images. but we cannot do this...for years i got hung up in trying to ' do' prayer correctly.. the holy Spirit showed me i was in error, as my trying to hard to do prayer correctly to connect with the lord kept me away from experiencing God moving within my heart as i was more focused on method.. i meant well but was missing the joy of just being in the prayer within my heart. Today, before praying the rosary i get up early each day and prepare to say the rosary . i sit before the Lord and the Blessed Mother and ask them to warm my heart , to quiet my mind , to allow me to touch the hem of their garment in prayer, so i can bring them those they have called me to pray for . This is no casual asking, i keep asking Them to grant me the grace to pray sincerely.. if i feel cold in my heart that day ... hardened by outward routine or cooled by formal reading or saying of traditional prayer , i ask Them to graft true inner prayer WITHIN my heart. i keep asking Them to grant me the grace to pray sincerely.. i do everything i can to prepare myself for prayer so i am not in my head. i use music ( i love Fernando Ortega's music) i light candles on my little shrine to the Divine Mercy .. i bow and do prostrations..I kiss Icons of Jesus and Mary i do everything i can before prayer to open the heart so that i may pray with FEELING.. and this is the key..to' FEEL' so when you pray the rosary , you pray with the heart and the words eventually fall away. as noted above, i spent a lot of years focusing on how to pray the rosary and other church prayers correctly ..rather than going into the heart deeply.. with feeling and love for God and mother Mary. for a long while i felt a bit guilty with letting the words drop when saying the rosary but an old nun told me this is how it is.. use words and pray the rosary until the words fall away and you are one with the Lord... yet of course we can do nothing to actually raise us.. it is ALL Him , His grace.... and all my trying to pray balance words and images were mind based. and my all time very favorite BOOK on prayer is, ' The Way of a Pilgrim' . it is a story about a simple Russian man who lived at the turn of the century who wandered around Russia seeking wise elders on how to pray unceasingly. This book i have read at least a hundred times. .. it is.. amazing. My favorite part of the book is when he walked 30 miles in two days to receive the Holy Eucharist and to be in the presence of Our Lord.. he literally walked through snow storms and an icy river to meet our Lord in Holy communion...arriving wet and dirty but his heart.. a heart of pure fire so filled with joy he was... as i write even now my eyes fill with tears i am so moved by the great grace of God to move this man so , to seek unceasing prayer. 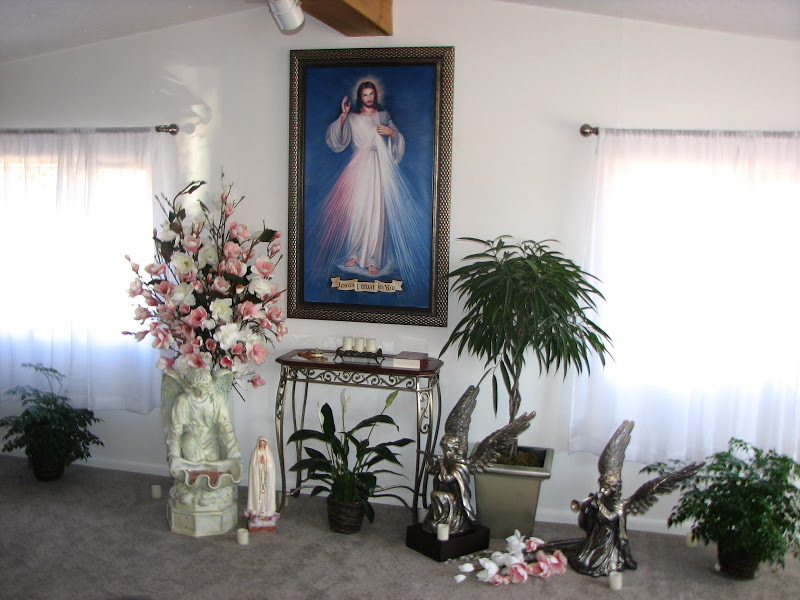 This Monday, October 15th, we are having a gathering of many people to HONOR Jesus of the Divine Mercy.....so please if you would like to join us , we will be praying the chaplet at 7 PM MDT.... if you cannot pray with us , please pray for the many people who will be attending and their needs and prayer requests that they will be bringing.... thank you. i hope this was not to wordy.. i do worry about such things .. but prayer is my heart and it is all i pretty much all i consider these days. That's very generous sharing of you, Christine, and it makes a lot of sense. I suppose it goes without saying (but just in case . . . ) that it is not mandatory for Catholics to pray the rosary. Although a uniquely Catholic form of prayer, it was not widely used in the Church for many centuries. Lectio Divina has been much more the foundational form of personal prayer, and there are many ways to do that as well. May God's holy peace and love be with all of you on Monday. that it is not mandatory for Catholics to pray the rosary. Thanks for all the sharing, it has definitely been helpful. I don't think I'll be praying the Rosary regularly at this time, but only if and when I feel led to by the Lord. I too am attracted to much of the Eastern Orthodox spirituality Christine, especially the Jesus Prayer. Your comments ring completely true and fit well with how I see God leading me in prayer. Much Love in the Lord Jesus to you All. Hope your prayer evening went well Christine. I'd like to ask everybody who has the time to please pray for me. I've agreed to a debate with a reformed baptist on the opposing arguments of Protestant and Catholic theology. I understand that some of you might think this an unhelpful engagement but for somebody like myself who is converting it provides (at least for me) a necessary balance checking of my decision to enter the Catholic church. I need to make sure I understand the key differences between the two positions and also know that I understand the Catholic position and can defend the validity of the Churches teachings on the faith and theology. Please pray that God will lead me as I discuss these things and even that my debate partner may be moved to reconsider some of his anti-catholic biases. Lastly I do want to say that while this person feels strongly that the RCC is wrong on a number of issues, he is engaging me in a kind and civilized manner and the conversation is taking place in a productive way. the dedication to the Divine Mercy was.... amazing. we had people on the phone from New Hampshire on speaker phone praying with us for a healing for a man who has cancer with a prayer group there.. we called others from Washington state right before we began to pray the rosary and let them know we were about the pray and they joined us... the whole night was.. incredible..
as people began to drive up the hill ( we live way, way up in the mountains on a dirt road that is horrible to drive on..it is a miracle people even were willing to drive way up here ) a HUGE rainbow appeared over our home.. people said it was the most beautiful rainbow they had ever seen and it was right over our house!!!! they said as they were driving here they could see it for miles... it started all the way from the bottom of the floor of the valley below us , and went directly over our house.. we never get rainbow out here!!!!! many stopped and took pictures of it, it was so breath taking. and Jacques.. i will pray for you....but i will share with you this.. debates about ones differences in religion as a means to become more clear about where one stands usually do not go anywhere.. it tends to go all mental and all parties involved come together to ' prove ' their side of it all..
it is my opinion that using this as a 'checking balance' could be tiring and taking you more deeply into your head trying to make a decision around converting to the catholic church. listen to your 'heart'... what does it know ? Sit in quietly in Adoration before the Blessed Sacrament.. read the Dessert Fathers and the lives of the saints ..... remain in the stillness of your heart ........infused in the light of His love..
MAY........ HE............ BE ..... PRAISED! There has been much good discussion comment in these posts on the rosary and Marian prayer and difficulties Protestants have in this regard, and also the diversity and varied approaches and experience that Catholics have in their use of the rosary and praying through Mary. And these of Shasha: “I totally agree with you on this, Jacques! I have those same feelings. I really don't like the fast pace that most people do the Hail Mary also. I'm almost panting for breath to keep up with others and find it distracting to be worried about keeping up at the expense of meaning what I say. Slower, intentional praying is more my thing when I pray Hail Mary or Our Father, etc. And these of Christine: “I have been praying the rosary for years and over time grace has changed the landscape of praying the rosary significantly. “…for many years I focused on the mysteries... today I do not so much anymore.. but looking back, I see it as a needed step in deeper union with God.”. As for me, I can readily see why many Protestant folk shy away from Marian devotion at the outset. And I grimace myself on occasion at some of the intensity in which Marian devotion can be couched by some folk. If you believed such intensity you would think that the book known to us as the Acts of the Apostles -- in which so much of the early activities of the church are described – could merely have been condensed to: “And all the believers would gather night and day at Mary’s home to say the Rosary”. Lol. The Vatican would have been located at the site of Mary’s house, and the Holy Spirit would never have had a role to play. Aiyee. Christ didn’t say that it would be better for us if He went, so that we could all hang out at His mom’s house and pray the Rosary. Perspective can be a wonderful thing. That said, I believe that while there can well be some agita resulting from devotees (some not all certainly) there should be no agita with respect to the rosary itself, nor Marian prayer and devotion/affection -- nor to praying through the saints or each other – since it’s all the same reality. We are all His discipled creatures and now part of His Mystical Body. Relationship can and does exist among us believers, and the Holy Spirit is the 'love sap' in which we interact and relate. United prayer we know is powerful – more so than personal prayer when interceding or petitioning. Personal prayer is the domain of one’s personal relationship with the Tritity and is essential. It grows to be contemplative. Both are apropos. Both foster community and communion. Both are activities empowered and elicited by the Holy Spirit – the Spirit of loving relationship. We relate with the Trinity and we relate with each other. We are saved in Christ – in His Mystical Body and not alone and outside of it. It’s the package deal par excellence! Vertically and horizontally and every which way, we are caught up in Christ. Like the vine which grows in myriad directions but always toward the Trinitarian sun. As for me, I too have moved over time, relative to how I pray in Marian regards. Anymore these days, I seldom say the rosary. I did often years ago, and liked the scriptural rosary for a while there. Yet, while I seldom pray the rosary, I do daily say some prayers (mostly adapted Hail Marys) praying through Mary. Mostly such prayers are those of intercession, in which I solicit her prayer support for those I am interceding for – or for personal petitions I am asking of God. I often solicit saints and angels as appropriate as well. Sometimes when I pray through Mary, I ask her prayer support for us who have not been so “Blessed Among Women”, for us who were not conceived Immaculate, for us who travail because of our concupiscence, the fruit of original sin; for us who may have been victimized and even more behind the eight ball as a result of such wounding. I sometimes ask Mary, who was so wonderfully graced, to solicit from her Son my request(s) for we who have not been so graced and are less fortunate and in need of His grace. 1). assailed by sexual temptation (as there is often no thorn bush around that I can throw myself into – lol, and I already look like a strawberry from the numerous past leaps). Praying through Mary, a woman, seems more potent somehow (to my mind anyway). 2) assailed by a demonic nightmare. Then I pray to Mary as ‘Crusher of the serpent’ as I consider her and Queen of the Angels (another title she holds). There is immense diversity with respect to private prayer practice in the church which is catholic and universal. Doctrinally and liturgically though, diversity bows to unity. With respect to your dialog with your protestant acquaintance, I commend to you EWTN’s “The Journey Home” show which airs several times a week. It addresses the issues that Protestant’s have with Catholic teachings and provides testimony to the questions, conversion experiences and the trials encountered by many converts and reverts in coming home to Catholicism. It is a great show for coming to an understanding of what is often encountered. It informs all of us on better ways to understand each other and to evangelize. Good luck, Jacques. I hope you know what you're getting into. Seems kind of premature to me. Glad to hear it went so well, Christine. Seems you might be coming into a new ministry, no? Pretty much the same here, Pop. Seems you might be coming into a new ministry, no? nah, i just pray... i see no ministry in the future... i don't see that in God's plan for my life.. Please remember me and all the other converts as you pray during the upcoming days. My wife and I will be received into full communion with the Catholic Church during the Easter Vigil on Holy Saturday. We are so excited. Much Love in the Lord Jesus to all of you and a special thanks to Phil, Shasha and others who have played such an important role in my conversion. Love to All of You. Oh my! So happy for you and your wife, Jacques. Countless Easter blessings!